Click the image above to download a PDF of the event flyer. (Dalton, GA, May 4, 2015) – Keep Dalton-Whitfield Beautiful is having a Compost Bin Sale during the Downtown Dalton Saturday Market at the Dalton Green. This Saturday, May 9, from 8:00 am to 12:00 pm volunteers will be selling a limited number of the “Garden Gourmet” Backyard Composter for only $45.00 each, almost 50% off the retail price of $79.99. Residents may receive a free perennial with their purchase while supplies last. Make your own compost at home with a backyard composting bin. 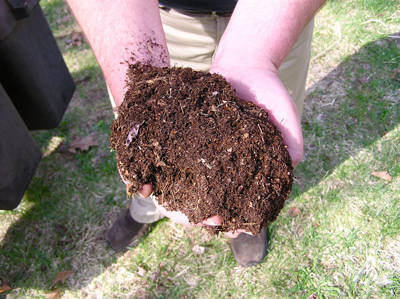 Compost is a beneficial soil amendment that can help your plants grow healthier. Gardeners refer to compost as “black gold” because it keeps food scraps and organic waste out of the landfill while allowing nature to recycle them into a nutritious soil amendment. Items that can be added to your compost pile include coffee grounds, tea bags, fruit and vegetable scraps, leaves, hair, and grass clippings. General composting information will be available to the public at no charge. The “Garden Gourmet” backyard composter is an attractive bin that fits neatly into almost any backyard space due to its compact size of 24”x24”x36”. The easy to assemble bin is made from 51% recycled plastic, comes with a composting guide, and includes convenient features like a sliding bottom door to remove compost. There are only 30 bins available for sale this year. Compost bins may be purchased with cash, or a check made payable to the Dalton-Whitfield Solid Waste Authority. A portion of each sale benefits environmental education for K-12 students in Whitfield County, and several Keep Dalton-Whitfield Beautiful events like Christmas Tree Recycling Day. For more information call Keep Dalton-Whitfield Beautiful at 706-226-6211 or visit www.keepdaltonwhitfieldbeautiful.org. International Compost Awareness Week, organized by the US Composting Council, is celebrated during the first week of May. For more information, and to learn more about composting visit the US Composting Council at www.compostingcouncil.org. (Dalton, GA, May 14, 2014) – Keep Dalton-Whitfield Beautiful is having a Compost Bin Sale during the Downtown Dalton Saturday Market at the Dalton Green. This Saturday, May 17, from 9:00 am to 1:00 pm volunteers will be selling a limited number of the “Garden Gourmet” Backyard Composter for only $45.00 each, almost 50% off the retail price of $79.99. Residents will receive a free perennial with their purchase while supplies last. The “Garden Gourmet” backyard composter is an attractive bin that fits neatly into almost any backyard space thanks to its compact size of 24”x24”x36”. The easy to assemble bin is made from 51% recycled plastic and includes convenient features like a sliding bottom door to remove compost. It’s an ideal choice for beginners since it includes a basic composting guide. There are only 60 bins available for sale this year. A portion of each sale benefits environmental education for K-12 students in Whitfield County, and several Keep Dalton-Whitfield Beautiful events like Christmas Tree Recycling Day. For more information call Keep Dalton-Whitfield Beautiful at 706-226-6211 or visit www.keepdaltonwhitfieldbeautiful.org. (Dalton, GA, May 9, 2012) – According to the EPA’s 2010 Municipal Solid Waste study, 27% of household waste in the United States is made up of food remnants and yard trimmings. These organic residuals can be very useful to the environment if they’re recycled into compost instead of being thrown away. Composting can easily be started in your backyard by combining landscape trimmings and food scraps in a compost bin. Nature takes care of the rest, producing a nutrient rich soil amendment through the decomposition process after several months. Compost producing bins are filled with a combination of “brown” materials, “green” materials, and water for moisture. Brown materials include paper, cardboard, dry yard waste like dry leaves, small branches and twigs, and straw. Greens include wet yard waste like fresh grass clippings, green leaves, as well as food scraps like vegetable and fruit peels, coffee grounds, and bread. Each category provides the nitrogen and carbon needed for nature’s recycling process to begin. When the material at the bottom of the bin is dark and rich in color, and has no remnants of food or yard waste, the compost is ready to use. To celebrate International Compost Awareness Week, Keep Dalton-Whitfield Beautiful is hosting a Compost Bin Sale at the Downtown Dalton Saturday Market. On Saturday, May 12th at the Dalton Green from 9:00 am to 1:00 pm volunteers will be distributing composting information and selling a limited number of “Garden Gourmet” Backyard Composters for only $40.00 each, 50% off the retail price of $79.99. International Compost Awareness Week, organized by the US Composting Council, is from May 6 to 12 this year. To learn more about composting visit www.compostingcouncil.org. For event information call Keep Dalton-Whitfield Beautiful at 706-226-6211 or visit www.keepdaltonwhitfieldbeautiful.org.